"Was everything ok" he asked? I’d not seen him pull up behind me on the shoulder. Despite his flashing lights. "Yes" I replied, slightly startled, curious as to why he’d stopped. He asked if I could move off the highway. "Of course Officer" I said, moving the bike further over. He returned to his patrol car and drove off, returning my wave as he went. He did the same when I saw him a little time later. I’d stopped to chat with Rocky, a new found friend from Palmer, Alaska. He was heading north towards Delta Junction to help his brother with some construction work. He’d spotted me on the road and pulled over. The highway was fairly quiet, and wide, but, explained Rocky, a few cyclists had been killed by protruding mirrors on passing vehicles. The State Trooper was just being helpful. Glennallen from Ken Roberts on Vimeo. 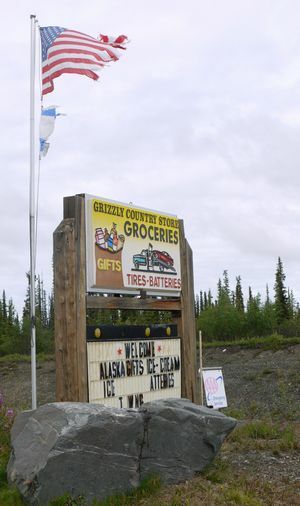 The small town of Glennallen in south-eastern Alaska. Blink and you’ll miss it. But do admire the snowy mountain back-drop. Wandering into the woods from Ken Roberts on Vimeo. The rains having finally stopped, Ken pulls over for a short coffee break on the side of the Glenn Highway, bound for the small town of Glennallen. Behind the counter lay a couple of charged magazines, the sort you’d use with an automatic rifle. Casually stacked on some paperwork, as if forgotten. Chris was an ex-cop. 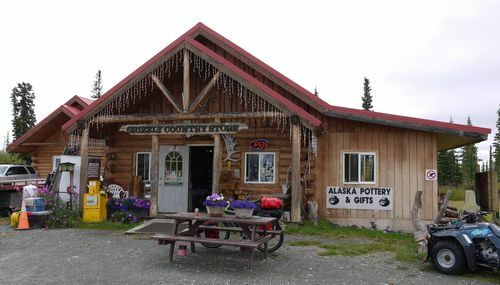 Now running the Grizzly Country Store, west of the small town of Glennallen on the Glenn Highway. He thought the riots in the UK were "everywhere". I suggested it was just a small, opportunist minority. But what was this jaywalking thing, I asked? At home, we took a fairly practical stance. If you walk out in front of traffic, be prepared to get run over. Tough, I explained. He pointed to the Israeli flag flying outside, beneath the Stars and Stripes, and questioned the British Palestinian Mandate. I didn’t pursue this, instead side-stepping the issue by suggesting all nations had history they might be less than proud of. 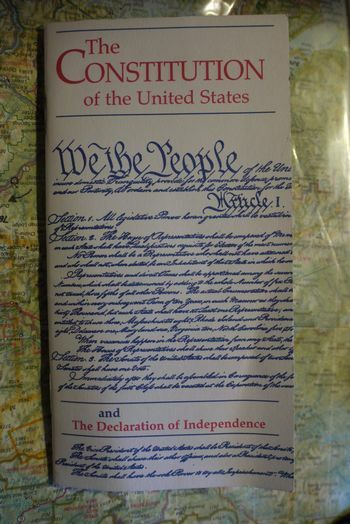 Chris was a passionate advocate of the US Constitution. Sensing my interest, he gave me a copy, explaining he’d handed out over five hundred in the last year alone. I smiled, thanked him, promised I’d read it, adding that whilst almost all of the UK’s Constitution is written down, it simply wouldn’t fit in your pocket. Instead, strewn across various Statutes, the Magna Carta, legal precedents and conventions. But we did have one. Inside the Eureka roadhouse it was little less gloomy than outside. The generator had failed but the coffee was still hot. And just twenty five cents a cup – less than twenty pence. I’d found a seat by the window, able to watch over my trusty steed. Light was eventually restored and the staff started to busy themselves once more with the attending to customers. My server appeared, as eager to remove my still full beverage as she was the empty plates others had left. Second day back on the road and a slow start. A tough twenty or so miles from Grand View. I’d planned to reach the small town of Glennallen that night, but it was now mid-afternoon and patently obvious I wasn’t going to make it. I felt nauseous, suspecting something I must have eaten had disagreed with me. The cafe had a greasy odour, not unpleasant, even attractive after a hard ride in the saddle. But not today. No appetite, even though I probably needed to eat. Decided to finish my coffee then wander into the adjacent gas station and see what lay on the road ahead. An early stop, good night’s rest was in order. Sickness at Slide Mountain from Ken Roberts on Vimeo. After a forced stop due to sickness, Ken notices Alaska’s not all steeply wooded valleys and mountains. Quite a bit looks like tundra. At least in the State’s south eastern region. Eureka! from Ken Roberts on Vimeo. Road works towards Glennallan from Ken Roberts on Vimeo. Ken makes a brief stop amongst road works on the Glenn Highway. Contemplating the return to the saddle, and the smell of coffee ahead…. Heavy rain overnight. Little respite in the morning. Brief spells of lighter showers. Low cloud on the surrounding slopes. Nearby peaks lost. The map suggested some over 10,000 feet. Yet surprisingly mild, despite being just a few hundred miles south of the Arctic Circle. Something insipid, draining about the precipitation. Sapping. Hoping always for a break in the evening to pitch the tent. Second day back on the road after the dental dramas. I’d felt weary the previous evening, but not tired. Strangely alert, as if the body was glad of the exertion. Fourth continent yes, but easier, no. Rather, probably just more stoic. Pushing the pedals would have been enough. But there were bears and moose to contend with. Or at least there might have been. Not yet. An understood but uncalibrated danger. Drawing comfort that steady traffic on the highway would deter them from venturing onto the road. But no certainty. Lingering thoughts about my tooth extraction. Tentative self-reassurance the gap, the dull, at times almost imperceptible, ache was just part of the healing process. Monte the dentist had said it would take time.